The Sneaky Chef are a series of cookbooks written by Missy Chase Lapine, former publisher of “Eating Well” magazine and cooking instructor at some of New York’s finest culinary schools. Lapine knows that parents will do almost anything to try to get their children to eat healthy food but experience has shown that techniques like begging, threatening and bribing are not effective. Unfortunately many parents “give in” to their children’s demands and allow them to eat what they want just to keep the peace. In her books Lapine provides almost 200 recipes that hide nutritious foods inside meals like mac and cheese, pizza, burgers and cookies, which children will enjoy, without realizing they are healthy. 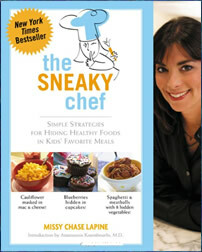 The secret to the success of the recipes in The Sneaky Chef is to hide the healthy foods that kids normally won’t eat by themselves inside the foods that they will eat. Many of these meals make use of blended ingredients such as fruit, vegetables, grains and beans because blending is one of the most effective methods for disguising their presence. Lapine explains that certain foods are easier to hide than others and the best are those that have a bland flavor and neutral consistency. There should be very few residual flecks of green and no lumpy, grainy or coarse textures. For example, she discovered that beets and asparagus are not good choices because they have strong tastes that cannot be masked. The healthy recipes in Sneaky Chef are simple and easy to prepare, with the majority taking about ten to fifteen minutes to create. There are also make-ahead recipe components that can be prepared ahead of time – for example on the weekend – and stored to use later. These components will require less than thirty minutes a week to prepare. If you don’t own a blender or food processor, or prefer not to spend the time making the blended components, you can use jarred baby food as an alternative. Some examples of foods that are hidden in kid-friendly meals are brownies containing spinach and blueberries, guacamole that includes spinach, broccoli and peas, and burgers that incorporate oatbran. In addition to “sneaking” healthy foods into meals, Lapine suggests that you identify nutritious items your children are likely to enjoy straight up. Some possibilities include strawberries, cherries, raw baby carrots, snap peas, popcorn, pistachios, corn on the cob and roasted crunchy chickpeas. Cauliflower, zucchini, peas, spinach, broccoli, yams, carrots, white beans, apples, bananas, blueberries, tofu, nuts, sardines, tuna, chicken, cheese, plain yogurt, whole wheat flour, oats, avocado, olive oil. Sneaky Chef does not include information about exercise but the author has published another book that provides tips on ways to sneak physical activity into your child’s lifestyle. The book: Sneaky Fitness: Fun, Foolproof Ways To Slip Fitness Into Your Child’s Everyday Life. 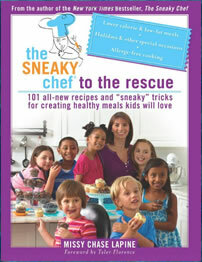 The Sneaky Chef: Simple Strategies for Hiding Healthy Foods in Kids’ Favorite Meals retails at $17.95. Brand new is her Healthy BBQ Recipe Collection that is full of great BBQ ideas and healthier versions of your favorites. “In this short cookbook, you’ll find entrees, salads, sides and desserts to wow your BBQ crowd, from juicy bacon and cheese stuffed-burgers to grilled romaine caesar salad, baked bean griddle cakes, to frozen yogurt cookies. Getting kids to eat more healthy food can improve their health, energy, mood and brain power. Sneaky Chef Helps take the stress out of family meals. Author is a trained chef and mother of two, with personal experience with picky eaters. Techniques are easy and require only minimal cooking experience. Provides information about the twelve most important foods to buy organic and the twelve least contaminated foods. Does not train kids to adopt a healthy diet as they grow up. Some parents may not be comfortable withholding the truth about the ingredients in meals from their children. The Sneaky Chef are cookbooks that help parents achieve their goals of getting their children to eat healthier by hiding nutritious foods in kid-friendly meals. These recipes will help take the stress out of mealtimes, while parents can feel assured that the nutritional needs of their children are being met. While this approach may not teach healthy eating preferences, parents are encouraged to identify nutritious foods their child will enjoy, while simultaneously educating their children about the importance of a healthy diet.